Inversion, as noted earlier today, had been limited to more distant years centered around 2020. 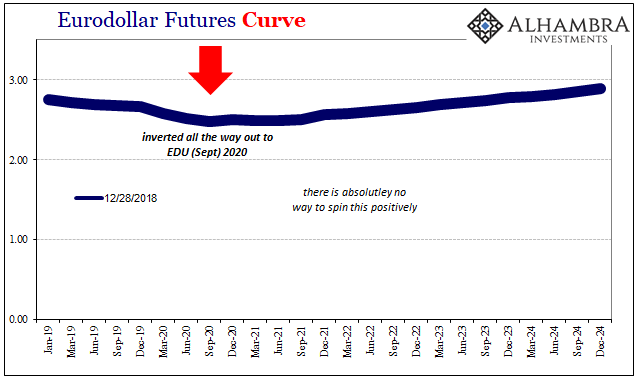 The eurodollar curve now sports inversion from the front month all the way out to September 2020. This is not a curve, not a normal one anyway, it is a clear signal of trouble right in front of us. In fact, almost the entire curve is currently below yesterday’s 3-month LIBOR. But strong economy or something. They really don’t know what they are doing. Central banks are not central. Happy New Year Jay Powell, the curve sarcastically frowns upon your ridiculously overoptimistic forecasts. 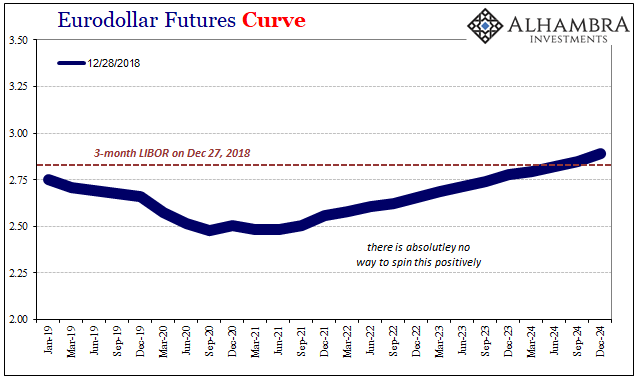 From here on, you are going to want to avoid taking any advice from Bill Dudley on the topic of eurodollar futures and inversions.